Venezuelan-American pianist Vanessa Perez returns to Americas Society on January 28 with her newest Steinway CD, Spain, featuring works of Manuel De Falla and Claude Debussy that draw inspiration from Andalusia. Her last performance at our intimate salon focused on Chopin's Op. 28 Preludes, a unique set of sentimental pieces. Vanessa Perez performs Albéniz at Americas Society, 2012. Mexican jazz singer Magos Herrera and Spanish flamenco guitarist Javier Limón are touring their second duo project, HeforShe, in support of the UN campaign for gender equality. They present a special Valentine's performance at Americas Society on February 11. They have recently been in residence at Brooklyn's National Sawdust. Herrera & Limón perform "My love for you" at Montreux Jazz Festival, 2014. Brasil Guitar Duo debuted Cuban composer Leo Brouwer's Sonata de los Viajeros in Havana in 2014, and now they are releasing a CD of Brouwer's complete works for two guitars on Naxos. They celebrated their release in mid-February with a concert at Americas Society as part of the Composers Now Festival. Brasil Guitar Duo premieres Brouwer's Sonata de los Viajeros in Havana. Led by Maestro Sebastián Zubieta, our in-house choral ensemble, Meridionalis, will perform two concerts as part of the 11th Festival de Música Antigua Esteban Salas in Havana, Cuba. Meridionalis performs In horrore by Francisco López Capillas. A few seasons ago, Momenta Quartet performed solo and ensemble works by Mexican modernist and microtonal composer Julián Carrillo, and they return to Americas Society in March for a more complete picture of Carrillo's string quartets employing his "Sonido 13" (13th sound). Musicologist Alejandro Madrid, who recently published a book on Carrillo's microtonal language through Oxford University Press, will be on hand throughout the evening. Momenta Quartet performs Carrillo's Meditación. The documentary La calle de los pianistas explores a small street in Belgium on which many concert pianists live, including Martha Argerich. Mother-daughter soloists Karin Lechner and Natasha Binder are the main foci of the film, which touches upon the legacy of practice within their family for generations. The film screening will be presented in collaboration with Cinema Tropical, with by a two-piano performance by Lechner and Binder the following evening. Cinematic trailer for the film La calle de los pianistas. In 1928, a group of composers from the Americas founded the Pan American Association of Composers, which hoped that "the performance of North American works in Central and South America and of Central and South American works in the United States [would] stimulate composers to make still greater effort toward creating a distinctive music of the Western Hemisphere." The wind quintet The City of Tomorrow, pianist Alexandre Moutouzkine, violist Stephanie Griffin, and soprano Sarah Brailey revisit some of the PAAC's early programs of chamber works by Chávez, Roldán, and García Caturla, pioneers of the synthesis of traditional and modern musics that swept Latin America during the first half of the last century. Amadeo Roldán, Ritmicas no. 5 & 6, conducted by Eduardo Leandro. 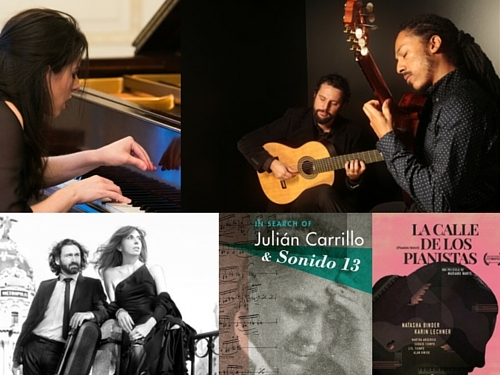 Image credits: Clockwise from top left: Vanessa Perez; Brasil Guitar Duo, image by Gal Oppido; Courtesy of La calle de los pianistas; Courtesy of Oxford University Press; Courtesy of the artists.